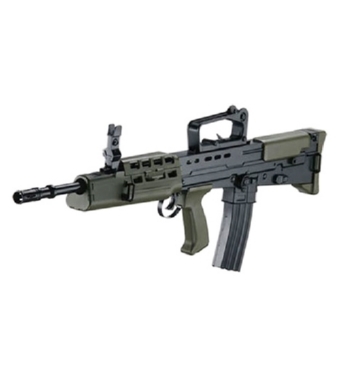 PRODOTTO DALLA ARMY ARMAMENT, FUCILE ELETTRICO MODELLO L85A1 CARBINE FULL METAL. BATTERIA IN DOTAZIONE 8.4V-1100mAh, CARICA BATTERIA COMPRESO. CALCIO IN GOMMA GRIP, MANIGLIONE DI TRASPORTO RIMOVIBILE, GUSCIO IN METALLO, GUANCETTE ANTERIORI ED IMPUGNATURA IN FIBRA DI NYLON, TACCA DI MIRA ANTERIORE.